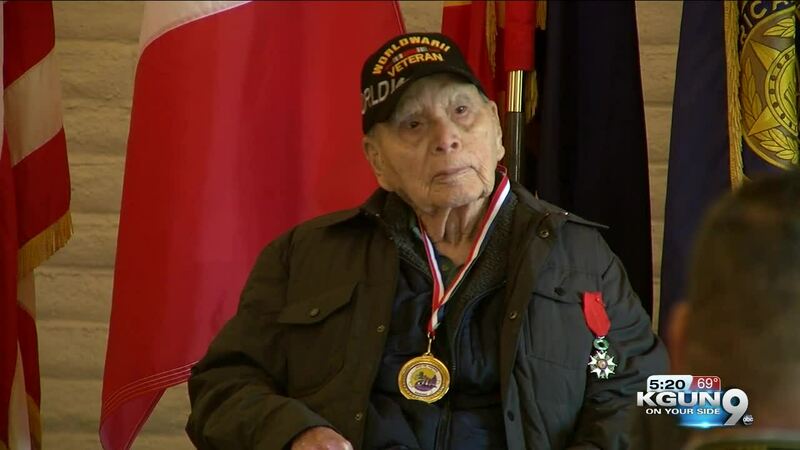 A Tucson World War II veteran was presented with the French Legion of Honor on Thursday. His service has inspired a legacy of national service within his family. One son, two grandsons and two great-grandchildren are all currently serving in the US Army. TUCSON, Ariz. — A Tucson World War II veteran was presented with the French Legion of Honor on Thursday. The award is France's highest award given to people for outstanding achievements in military and civilian life. Private First Class Margarito S. Ramirez, entered the army in 1942. He served in Normandy, Northern France, and central Europe. Because of an injury, he was discharged in 1945. His significant awards include the Purple Heart Medal, the Combat Infantryman Badge, the Expert Infantryman Badge and the EAME Campaign Medal with two battle starts. Margarito and his wife, Belia, live in Tucson. His service has inspired a legacy of national service within his family. One son, two grandsons and two great-grandchildren are all currently serving in the US Army.